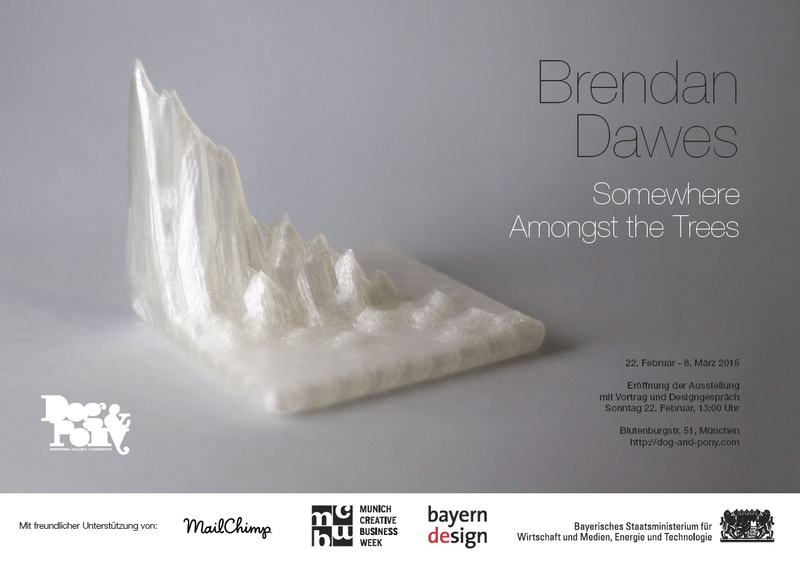 we are delighted to be able to present you a very special event on this sunday (yes, this comes at very short notice, it’s the 22nd of February): we have invited the designer and artist Brendan Dawes to Munich for a solo-exhibition titled “Somewhere Amongst the Trees”. Brendan is a long-time friend of ours and we highly appreciate his works and ideas. He is also one of the most charming and amazing personalities which you should not miss the chance to get to know. Brendan has created new interactive sculptures especially for this show, but of course we will also have several of his classic pieces like “The Happiness Machine” or “Cinema Redux” which is also in the permanent collection of the MoMA. Before the opening of the show, Brendan Dawes will give a talk about his work followed by a Q&A where you have the opportunity to get in conversation with the designer. If you know our place, you also know that seating is very limited, which is why we moved this part to the Maxim Kino next door, just a few minutes walk from the Dog & Pony. Supported by bayern design and the Bayerisches Staatsministerium für Wirtschaft, Infrastruktur, Verkehr und Technologie.